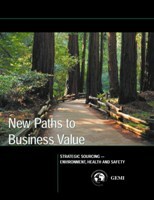 New Paths to Business Value: Strategic Sourcing—Environment, Health and Safety is designed to address the business value of managing Environment, Health and Safety (EHS) in Procurement. It is designed to help identify when, why and how to pursue added business value by addressing the EHS performance of suppliers and contractors, and understand how their products and services might affect your business. This document illustrates how business value can be enhanced by adept management of EHS issues in the supply chain; encourages a selective approach that is appropriate for each unique company and for different types of suppliers and supplier relationships; provides practical resource for procurement staff, helping them understand and pursue business value opportunities that might otherwise be missed; encourages dialogue and effective collaboration between procurement and EHS departments; and steers companies toward practices that add business value. Topics (chapters) and case studies have been chosen to help you identify and pursue selected business value opportunities, with selected suppliers, using appropriate procurement tools as described in the table. While the topics are complementary, each topic section has been composed as a stand-alone resource and is organized to answer a question. While Topic One does provide an introduction, the remaining topics are not written to be read in any particular order. • Topic One: Is EHS an important source of business value in my supply chain? • Topic Two: How do I find untapped business value in my supply chain? • Topic Three: How can procurement add business value? • Topic Four: How can I assess and improve supplier EHS performance? • Topic Five: How can I improve EHS performance through outsourcing? The Appendix includes recommended resources, a glossary and a table summarizing the contributions that other corporate departments can make to a cost-effective supply chain management effort. Because this document intentionally emphasizes certain procurement challenges and opportunities, it does not provide even or complete coverage of all procurement tools or all ways that procurement can add value with regard to EHS performance. Redesign of products and processes (Design for Environment, or DfE) – often the most valuable way to improve EHS performance – has been left for another work group to explore. The importance of whole-system optimization in supply chain decisions, which requires an integrated multi-departmental planning effort, has been outlined but not explored in depth.